Home » Manufacturers » AQUALARM » AQUALARM SMART BILGE ALARM,.. The Smart Boat Bilge Alarm lights the Red light when the pump comes on and then activates a panel mounted, loud buzzer if the pump runs longer than 2 minutes...indicating excessive pumping. After the float drops the Smart Alarm will pump for 15 additional seconds to clear all of the water out of the bilge. Especially useful for deep bilges and bilges with long discharge hoses. 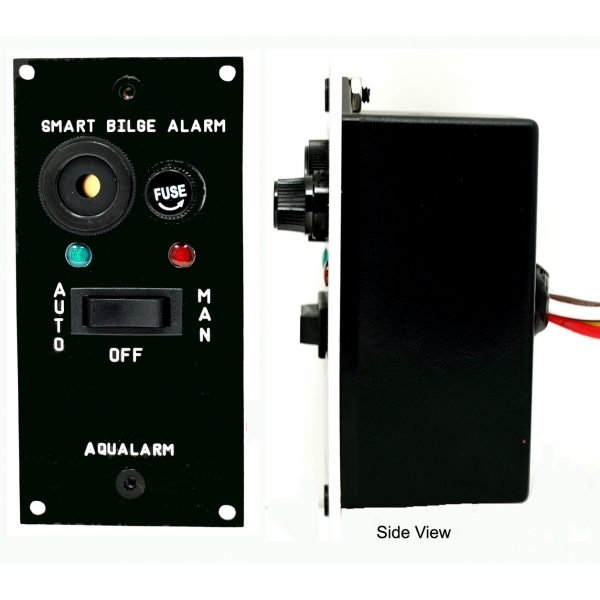 The Smart Boat Bilge Alarm comes with a Green ON light to assure you there is power to the panel, a Fuse Holder for safety, and a HD 30 amp AUTO/OFF/MAN switch for controlling the pump. The 20090 Heavy Duty Pump Switch is recommended but any pump switch can be used. Panel size 2-5/8" wide x 5-3/8" high x 2-1/8" deep. Sealed backing box for added moisture protection.